Yakety-yak and a ticky-tak-talk and a chitty-chit-chat and a smoochity-smooch and a lovey-bug-hug and a sniffly-sniff and a hacky-yack-hack and a tooty-toot-toot and a giggly-goo and a sing-sangy-song and a laughity-laugh and a… zzzzzzzzzzzzzzzzzz… and so many more! Those are the bestiest-best-sounds of all! 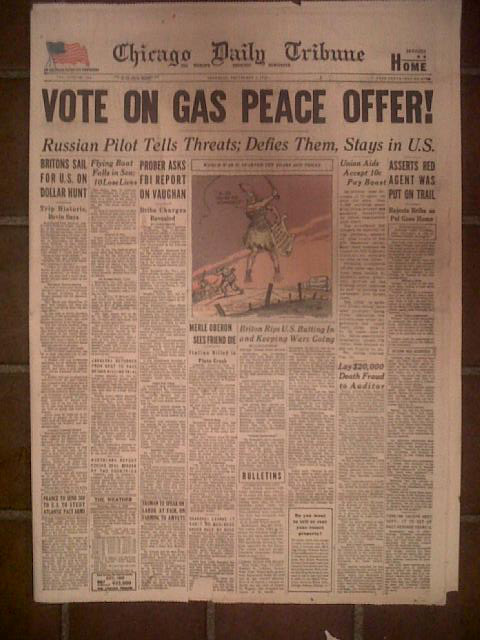 The original post here if you’d like to read along. Or here you can read about the real Abbie Hill in the photo. Old houses are mysterious places, filled with stories and history and artifacts and memories of all the residents who have ever called that house a home. 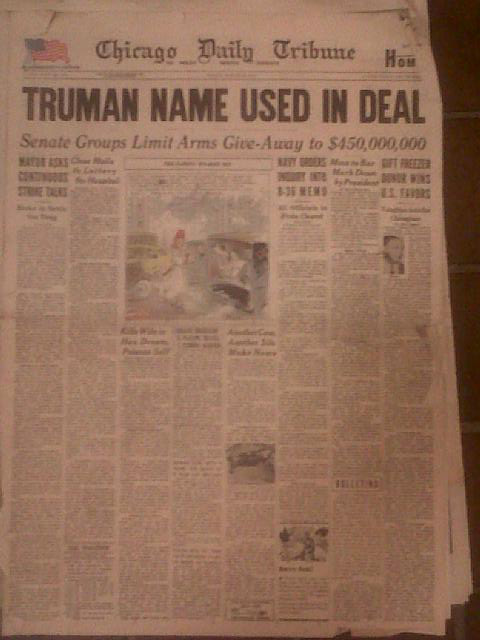 Sometimes those mysteries are in plain sight, easy to see, easy to decipher. Other times houses hide their history under layers of paint and wallpaper, or inside walls, or under floors, only to be discovered when renovations are in full swing. We’ve all surely read stories of homeowners finding jewels or money hidden under floors or in spider-web covered attics. People find household items and tools that were accidentally dropped inside unreachable crevices during building or renovation. 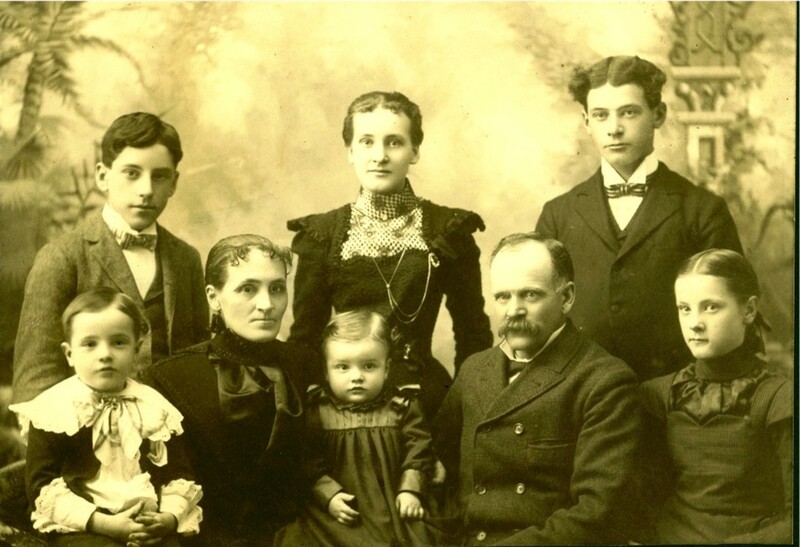 Occasionally lucky homeowners discover old photographs and letters that were intentionally left inside a wall by previous residents who knew that someday someone would be tearing into that wall as their family grew. We have done our share of renovations at Brown Road, but so far have not found a hefty bundle of cash inside any walls. Our contractor did pull a small, seemingly handmade hammer out of the inside of a wall during one stage of our construction and we found a picture of two young girls that appeared to be from the late 60’s or early 70’s. More recently we began updating my son’s bedroom. Under layers of carpet and linoleum type flooring, we discovered a section of the floor that had been insulated with layers of newspaper. We had known it was there from pulling up corners of the carpeting years ago to see what the wood floors looked like, but it was only now that we finally began to update this particular room. 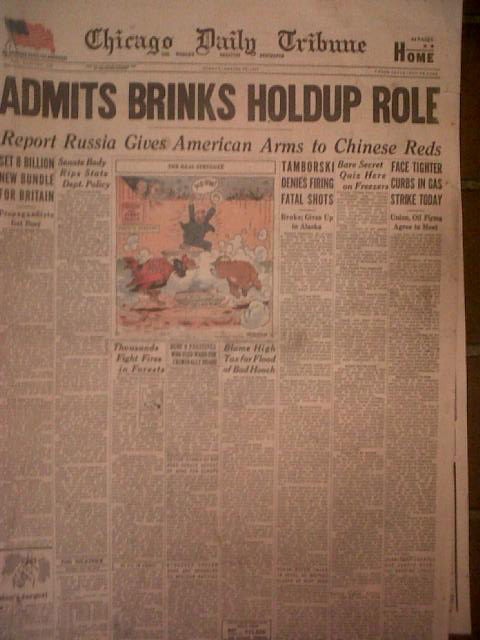 These newspapers were Chicago Tribunes, from various dates in 1949. They were in amazingly good condition, preserved under layers of flooring and there were probably at least one hundred pages to look through. There were so many fascinating things to share, but in the interest of brevity, I picked just a few interesting items and photographed them to share below. 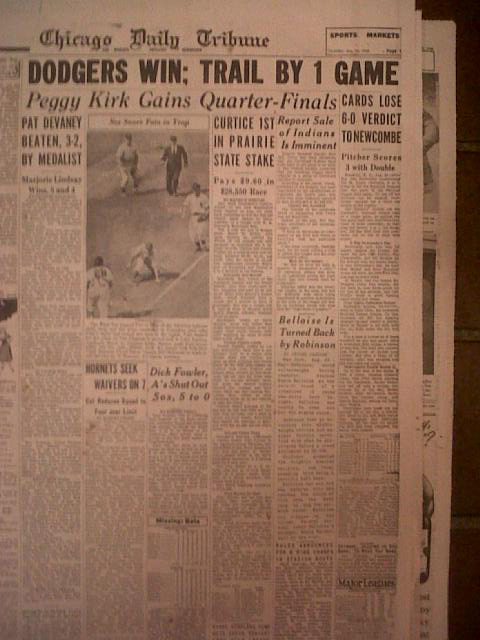 From the sports page… YES, that would be the BROOKLYN Dodgers. 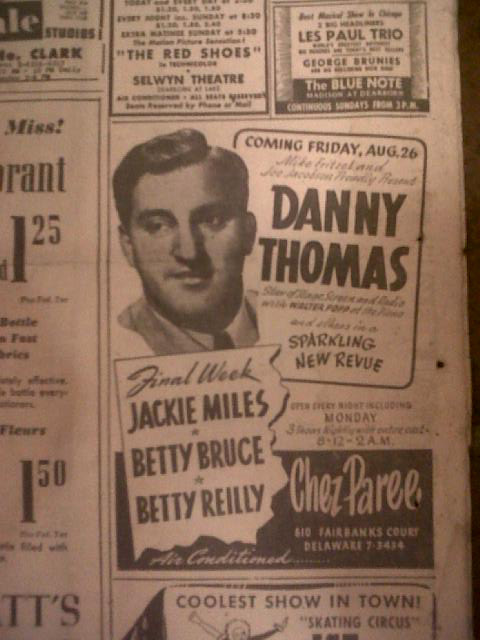 In entertainment… Danny Thomas at the Chez-Paree. 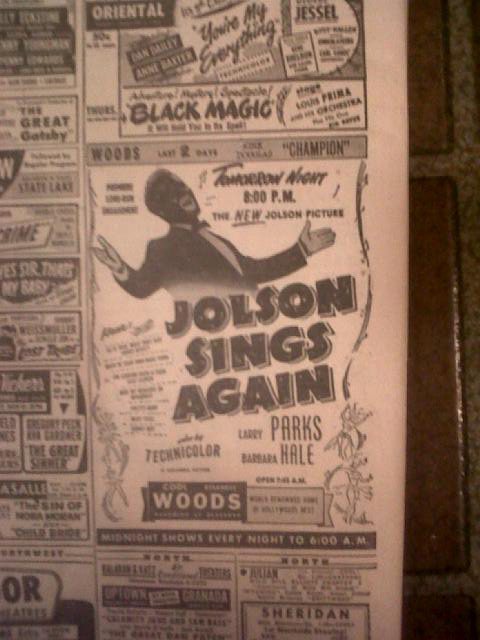 and Al Jolson singing in “black-face” would be frowned upon today. 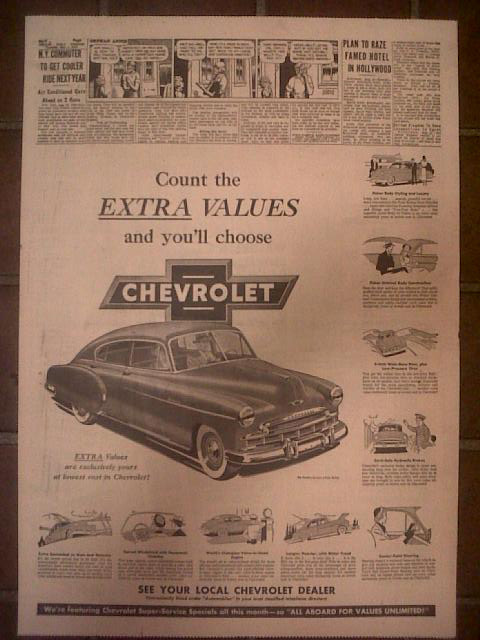 Before the bailouts, when Detroit was KING! Back from the war? 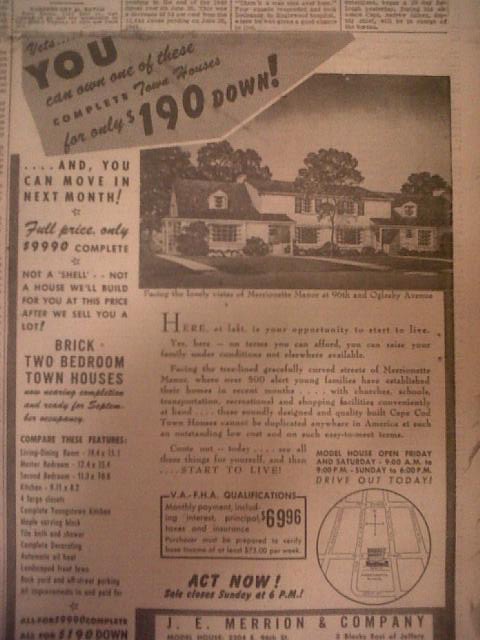 You can own one of these town houses for only $190 down! 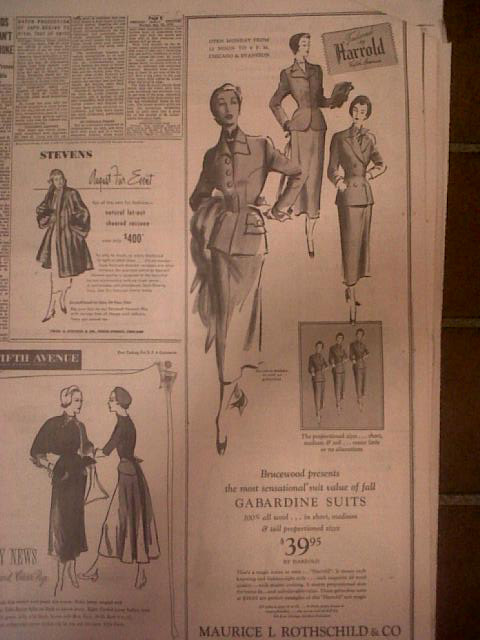 For you ladies, here’s some fancy Gabardine suits for only $39.95! 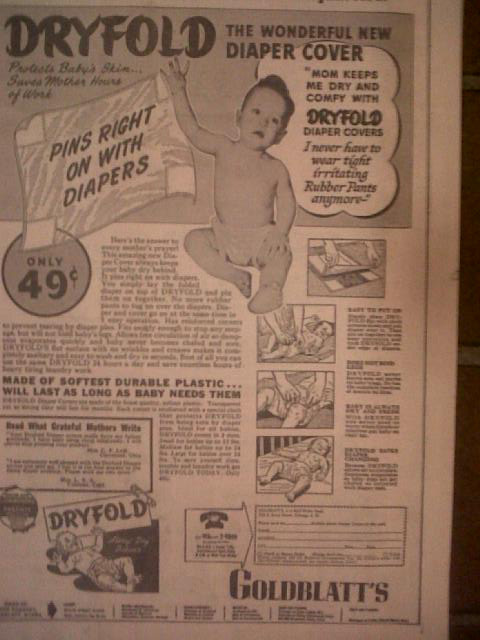 and for Mom and Dad, keep your baby Dry and Comfy. I could have gone on and on, there were so many interesting and unique articles and photographs and advertisements. So, I won’t encourage you to go tear up some old flooring or punch some holes in your walls. But, you never know what might be hiding inside your house!